Wolverines! It is America’s most desperate hour. Beleaguered on three fronts, these United States struggle against an unthinkable invasion of the land of mom, apple pie, rock ‘n roll, and freedom. Forget the TSA, high taxes, and Obamacare. Lady Liberty’s very way of life threatens to vanish in the pages of history. Will hordes of barbaric invaders sweep unopposed from sea to shining sea? Or will guerrilla citizen-soldiers rise up through hill and dale to help their reeling army stem the tide until America’s massive lasers can blow the enemy back to the motherland, proving we really are the Home of the Brave? I’ll begin by saying that this is one behemoth of a title, with a lot going on. Keep in mind when reading that there are some rules and thematic chrome which I will not cover as I discuss primarily the core game system. 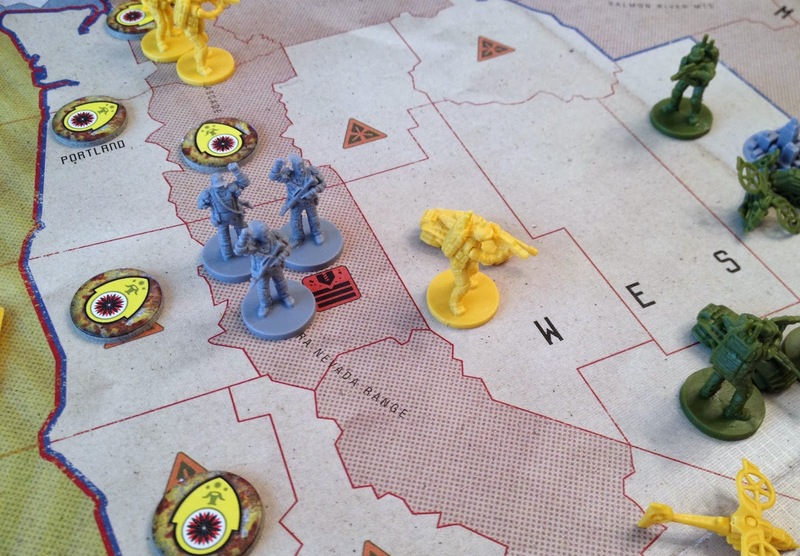 In its essence, Fortress America is a dudes-on-a-map war game with area movement/control, dice-based combat, variable powers, and card play. Nostalgic fears of global thermonuclear war for those born pre-1980 is an added bonus. There are many elements, mechanics, and small twists that make this title a very unique entry in the genre – or did when the first version released in the mid-1980’s. Some have influenced later designs while others remain distinctive. Rather than number them off or repeatedly say, “another unique thing is,” I’ll instead ring a little bell. So whenever you hear the sound (*ding*), you’ll know that I’ve just mentioned another distinguishing characteristic. Behold the beauty! The game is set-up! Fortress America pits Uncle Sam against a tri-front invasion so that the game is played with a non-negotiable 3-on-1 allied system (*ding*). 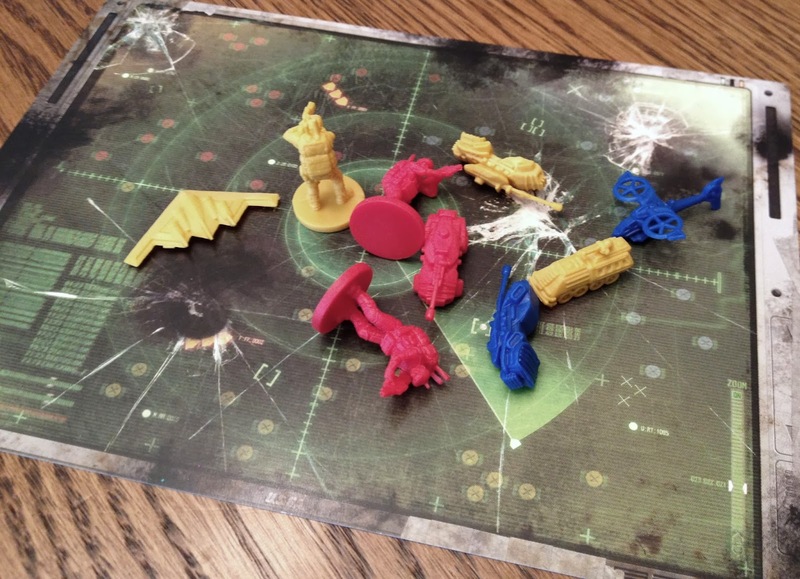 If the invaders in a 3+ player game are victorious, then there is a variant to allow for a specific single winner, but the trespassing factions may not fight each other during play (*ding*). Each may maneuver in a manner singularly advantageous to themselves or refuse aid when requested. But they will generally need to work together in some fashion to keep America from gaining the upper hand in any one region, lest it proves detrimental to the other two groups elsewhere. Turn structure is divided by phases, one of the more familiar mechanics customary to war gaming. With minor variation, the three invaders first each take their turns individually resolving all phases before the U.S. likewise moves. In strict order, players will deploy new reinforcements, declare battles, maneuver units in preparation for battle, conduct combat at declared sites, and then invade territory won and/or reinforce friendly areas. Before combat, the U.S. player additionally fires each of his lasers at an enemy unit. America builds one new emplacement at a different city each round during the reinforcements phase, each one targeting separate territories. 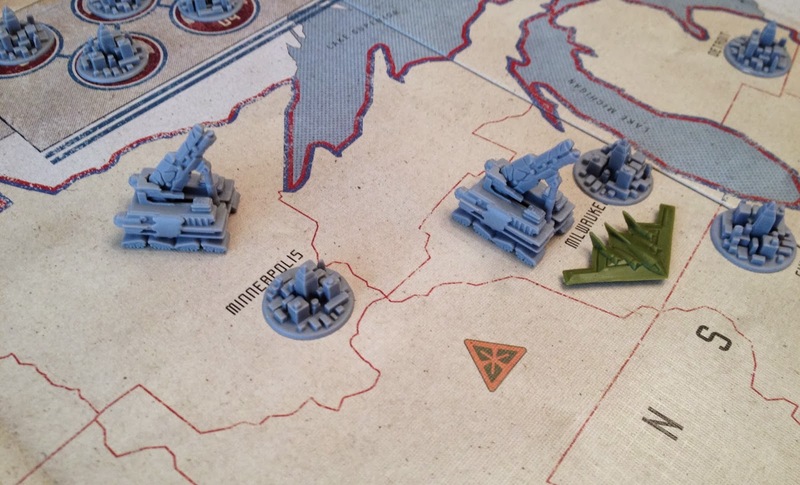 The invaders also have a separate phase to check supply lines at the end of a turn. If a unit cannot trace a line of friendly territories back to its own invasion zone, it is destroyed. All four sides have the same basic units – infantry, mobile units, hovertanks, helicopters, and bombers. The U.S. also has special partisan troops. All of these have varying movement ranges, special capabilities (*ding*), and roll different sided dice in combat (*ding*). Infantry can’t move during the maneuver phase, but a mobile unit can carry one while it does (*ding*). Helicopters can scout ahead before combat and occupy territory behind enemy lines (*ding*). Partisans fight better when on their own (*ding*). Attackers gain a combined arms advantage when assaulting cities or mountains with at least one foot, mechanized, and air unit together (*ding*) (*ding*) (*ding*). The Southern bloc begin a combined arms assualt on Dallas. Jerry World would make a luxurious C&C center! 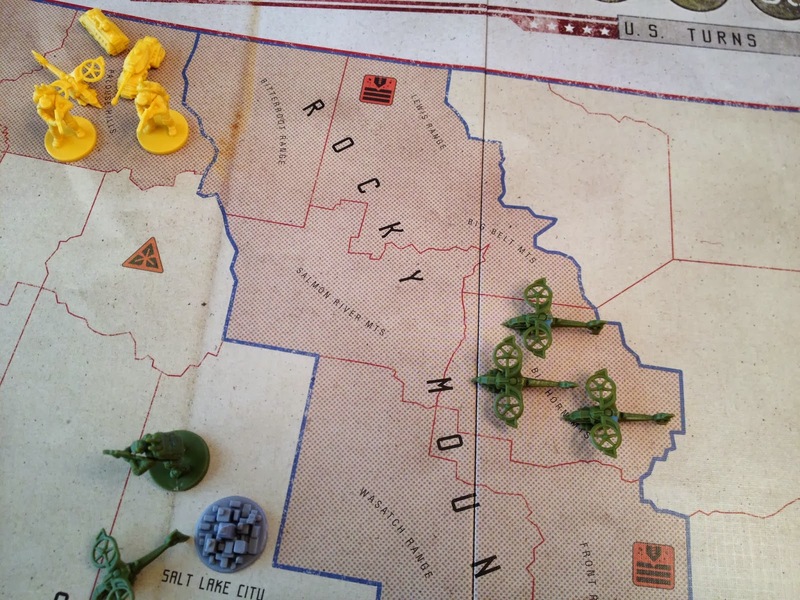 The U.S. player begins the game with all sixty of his regular army units deployed throughout the country, two per city as he sees fit. Each city territory also receives a city marker, which are removed as they fall to the invaders. The aggressor factions begin with a set number of units deployed to their invasion zones in whatever manner the player wishes to divide them. After that, reinforcements are not purchased (*ding*). The invaders get eight new units each turn, with the player choosing which types and in which invasion zone to deploy them (*ding*). The American player draws two partisan cards each round (and can receive more in play). 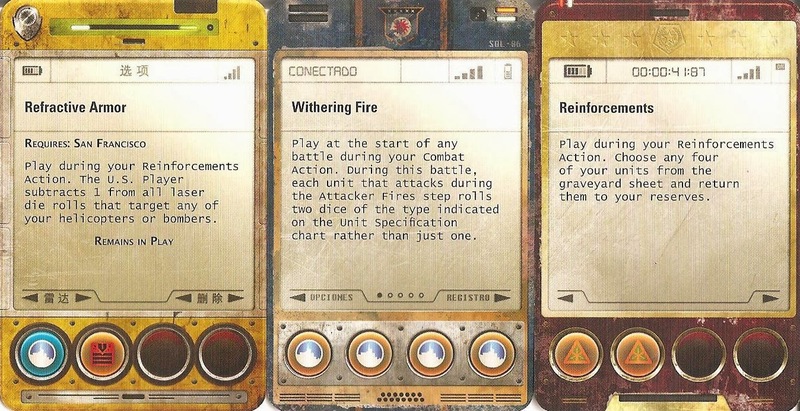 These cards specify the number and types of units he will receive, where to deploy them, and sometimes provide for a special – and powerful – ability. Combat is actually resolved quickly, because it only lasts for one round (*ding*) (*ding*)! That’s right. If the defender can withstand one barrage, they survive to fight another day – or turn. Furthermore, they get to roll first AND remove any successful casualties before the attacker can thus return fire (*ding*). While this may sound like it would discourage offensives, the defender will never have more than five units defending, as that is the maximum allowed to occupy any one territory (*ding*). So there are never ridiculously formidable bastions of non-ending ranks of infantry. Meanwhile, the attacker can bring the house – or whatever is in range to maneuver adjacent to the target before the combat phase. Of course, the caveat is that he may only move in a max of five units himself after a successful attack. Better units get better dice (more sided). The d10 is for lasers. While the invaders maintain numerical superiority in the first half of the game, they will need to be resourceful as the war develops. While the Americans receive, on average, smaller numbers of reinforcements, they at least can recycle their units. The Barbarian hordes, on the other hand, are finite (*ding*). When losing a piece in combat or due to lack of supply, it is removed from the game. Play continues through these general phases of reinforcement, maneuver, battle, and more maneuver until one of three victory conditions is met. If all of the invaders’ units are destroyed, then America is understandably victorious. While that condition sounds like total annihilation typical of the genre, it’s also not very likely because the game will last no longer than ten rounds (*ding*). 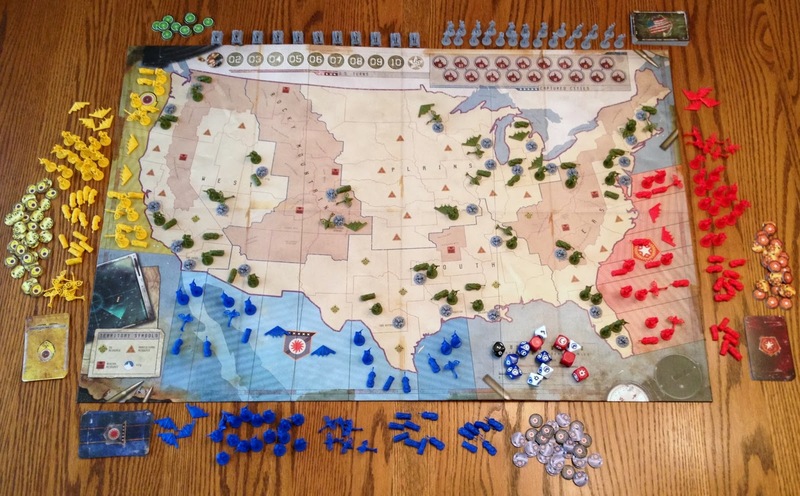 Instead, a typical game either runs the full ten turns with the U.S. holding on to at least thirteen cities; or the aggressors win after occupying eighteen or more urban centers after the end of any U.S. turn. @spielemitkinder’s take: Land of the Free? Or An Nyoung, Comrade? I cut my teeth in hobby gaming with Milton Bradley’s original titlein the iconic Game Masters series. First released in 1986 during the Cold War and a couple of years after the movie Red Dawn (the first one), Fortress America inspired all manner of unfounded fears and unmitigated patriotism in its fictional conflict. Well, at least it did for a handful of junior high boys. Back then, we were all sure Soviet Russia, Communist China, and that crazy, bearded guy in Cuba were all plotting an American takeover at the first convenient opportunity. Of course, they could never really all work together – and a land war in North America would go over about as well as one in Asia. But it made for a really cool, fun war game. Interestingly, the political overtones of Fantasy Flight’s revised design have changed amidst a very different global climate. Gone is the Communist threat, replaced with general Terrorism. Enter unstable, unpredictable, and not-as-scary North Korea in place of the more reliable, very menacing, Soviet monstrosity. Without two “super powers” squaring off toe-to-toe in the modern era, support for American involvement around the world has waned considerably, while nation building and puppet propping is decidedly more subtle and covert than it used to be. Some one could probably write a paper comparing the design in both worlds – but I’ll take a look at the game itself. A chopper convoy heading to the aid of the West. Beginning with logistics, let me start off by saying this is an interesting game for two OR four players, but not really with three. Yes, you can still play it with one player handling two of the invaders, but it’s more disjointed and awkward, and not as fun for the third invader. It works well with one individual handling all of the invaders, though that person has a lot more to do. With four, it shines perfectly. I’ll reiterate, if it needs to be, that this is not an exercise for new or casual gamers. 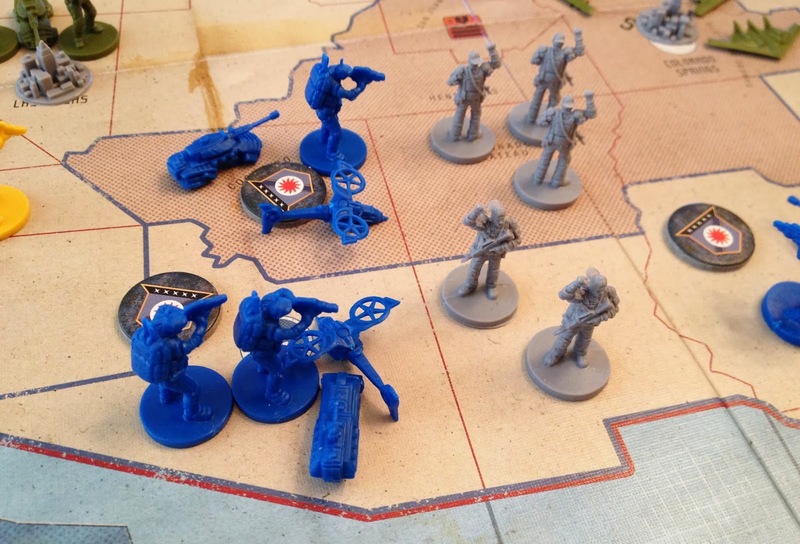 Furthermore, even experienced war gamers will need to rethink some of what they’ve come to take for granted in the genre. 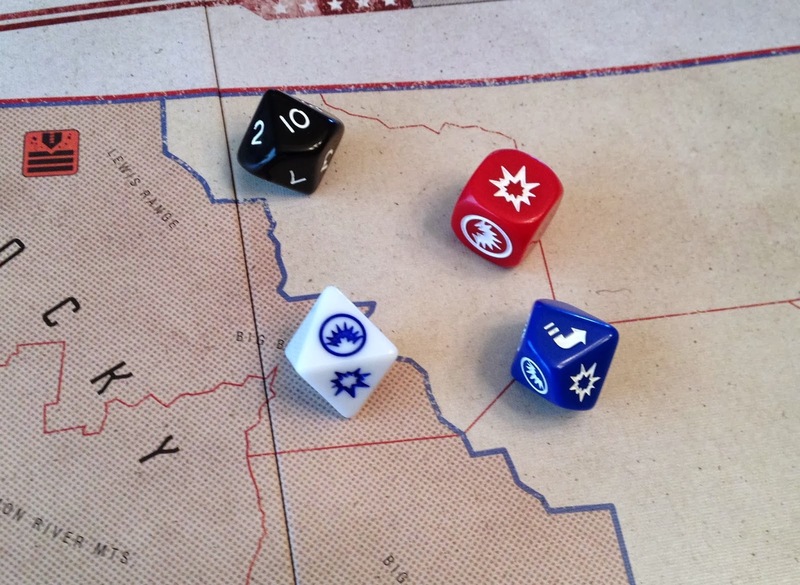 Fortress America’s unique mechanics require a change in strategic gears. Probably the biggest point of contention is players fighting over who gets to be America. The U.S. side is just more fun to play, even if you personally are not an American. One, it is challenging to learn to play effectively, at first. Two: Lasers! 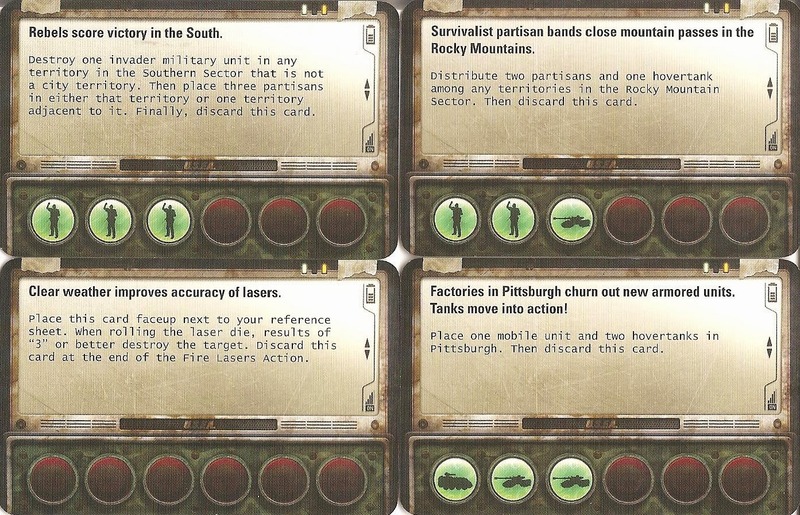 Last, the Yanks provide a great deal more variety and replayability with their random reinforcement cards and laser construction. Aside from that, once you know what you’re doing, they are generally easier to play. However, there is no guarantee, of course, and so the tension wrought from the game’s design is wonderful. At first the invasion sends the Americans reeling under overwhelming numbers. The situation looks quite desperate for the Land of the Free about five turns in before the U.S. can stem the tide and even turn things around. Then again dice heavily influence the development of the narrative, adding even more great tension! Laser installations in the safest place…as far away from the action as possible! That’s not to say the invader factions aren’t any fun to tackle, at all. The main problem is that once all of your forces are committed and you can no longer replace losses, your strength dwindles as the U.S. can afford to create delays in a war of attrition. Even as you get new troops through the first several turns, they must deploy in the coastal invasion zones. After a few rounds, that is usually a few territories behind the front and so it takes time for them to effectively reinforce your positions. In the meantime, U.S. reinforcements and partisan troops are popping up all around you at the most inopportune and frustrating times. On the positive side, the later-game tension that this expansion creates can be as fun as the early game for the Americans. Each faction does play a little differently. The map is designed to balance the number of cities immediately available for capture, as well as those in the “next wave.” After that, the conquest changes and offers some options. The Eastern bloc is soon confronted with a mass of cities, and thus more units, in the Great Lakes region. They also can move up into New England which, along with the Florida peninsula, gives them two secluded “safe havens” once secured. The Western faction deals with a lot more open territory after the first two turns and will be hard pressed to support a strong move inland. Conversely, they seem to face less opposition than their two allies. Finally, the Southern group is even more unique with a mixture of open space and urban centers. They have an extra city which they can possibly take in the first wave, but the challenge is to maintain an offensive, while simultaneously working with and supporting the West and East on either side – or not. Mixing up play with the factions each session is recommended. Otherwise, you’re likely to adopt a standard strategy and the result will feel routine. The Fantasy Flight version includes special action cards to provide some variety for the invaders, but they’re hit and miss in both fun and functionality. Invaders’ action cards. Note the icons at bottom on conditions you must meet to use these. Combat resolution in Fortress America is one of the more incredible and interesting elements that profoundly impacts planning and strategy. A battle lasts ONE round. The defender fires and then the attacker fires, and then it’s over! This is a fundamental change from most war games which stipulate that combat continues until one side is completely eliminated or voluntarily retreats. So you have to rethink how and when to fight and what to bring. It’s not enough to have superior numbers just hoping to whittle down the defenders. You only get one round in an assault per turn. And since the defender shoots first and removes casualties before they can return fire, the odds can plummet faster than you may realize or have prepared for. The territory unit limit is another strategy-restricting mechanic that requires planning. On one hand, it’s good to know that your enemy will never have more than five units defending any one territory. But on the other, it can impede your own ability to maneuver and assemble a large enough attack force adjacent to a desired target. It’s a rule everyone must learn to live by. In the end, theme and chrome mesh epic narrative and little details seamlessly together. Looking at the board from a satellite’s view, the story arc is sweeping as waves of invaders push America to the brink. Yet focus on individual territories, and each chapter plays out with aspects that make sense. Different sided dice represent the relative strengths of the separate unit types. Combined foot, mechanized, and air assaults increase your odds as would be true of modern warfare. Partisans fight better when unencumbered by regulation military. Even the arbitrary ending illustrates the idea that a successful American defense would most likely be as simple as outlasting the enemy. Both theme and minutiae are engrossing and captivating enough to soften the time blow that the genre can often inflict. Partisans arise in the Southwest. Head for the hills and hit ’em hard where it counts. @futurewolfie’s take: Red, White, and Blue or Better Red Than Dead? I had originally intended to review this game on my own; after all, a big flashy Fantasy Flight title with futuristic elements, asymmetrical powers, and boatloads of miniatures? What’s not to like! On paper, at least, this should be a game I really rather enjoy. But when I finally got my hands on a copy and got it to the table, my experiences were not up to my expectations. I needed to hear another perspective, to help figure out if my sights were off; it’s not too often that you get that chance, but fortunately our resident war gaming fanatic not only had his own copy of the game, but had played the original version many years ago. This was the extra perspective this review needed, hence the double-review. There’s something about Fortress America that just doesn’t set right with me. Oh, don’t get me wrong; I love the asymmetry of it all, I love the plastic miniatures. Despite this being quite the behemoth of a game, the rules are not over-taxing. Partisans pop up behind the front to cut off the enemy’s supply lines. But playing the game just didn’t live up to expectations. A big part of this is the lengthy playtime; don’t believe the box, which says 2-3 hours. We’re talking more like 4-5 here, and pushing even higher. It is probably the playtime alone that damages the game. If the game could be completed in 2-3 hours, it’d be an action-filled good time. The lengthier playtime serves only to accentuate the flaws – the lack of real replay ability and the long periods of waiting before your turn comes around again. Lets hover on the replay ability for a moment. What I like about combat-centric games, especially dudes-on-a-map, is the tactical nature of maneuvering your troops, taking risks, and knowing when to consolidate your forces and defend instead of pushing forward. Unfortunately, the asymmetry in Fortress America is created not by giving players unique powers and abilities, but by forcing players into a very particular rut. As an invader, you don’t have the time to fall back, or to regroup. Your only choice is to push forward as quickly as possible. Limitations on troop movement force the invaders to bull-rush as fast as they can, taking cities along the way, heading for the most central cities that take the longest to reach. There is no real choice in the matter; the only choice is in how exactly you arrange your troops, which just isn’t very much choice at all. Partisan cards for U.S. reinforcements. The game is programmed, and it is pretty linear. The invaders will ALWAYS win the first few rounds of battles; they simply attack with overwhelming force. 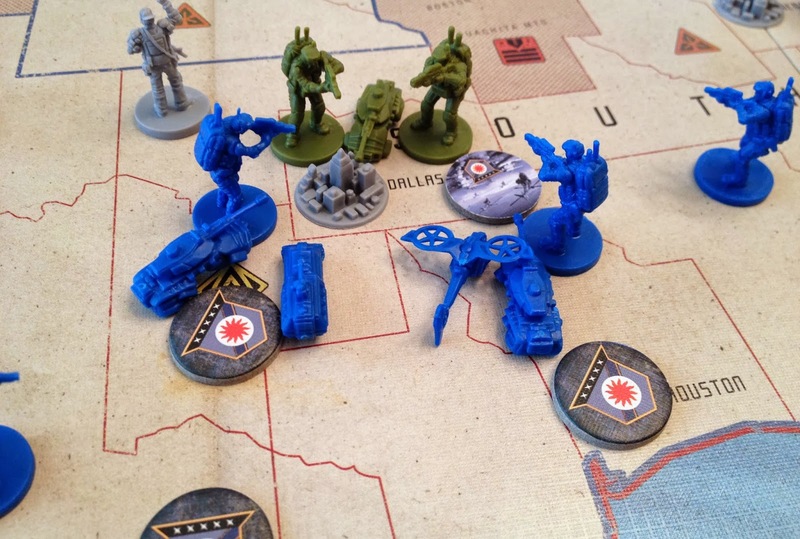 The USA forces are spread thin and can’t reinforce troops anywhere; their only recourse is to retreat and consolidate forces until they build up their laser grid and have strong defenses in their remaining cities. Because of the movement limitations, the US barely has even the burden of defense; they don’t really need to spend too much effort defending their front lines because even if left completely defended, the invaders can’t just rush through. This programming does serve to create a ramping tension, but it’s the same tension every time. This game is a product of a bygone era, before many of the modern gaming advances we have today were invented. It comes from a time when you had children’s games, monopoly, and complex war-games, and thats about it. The world wasn’t as fast-paced; computers were not so prevalent and video games had not saturated the culture. Kids, teens, and college students had time to burn 5 hours on a wargame like this, and that’s okay. 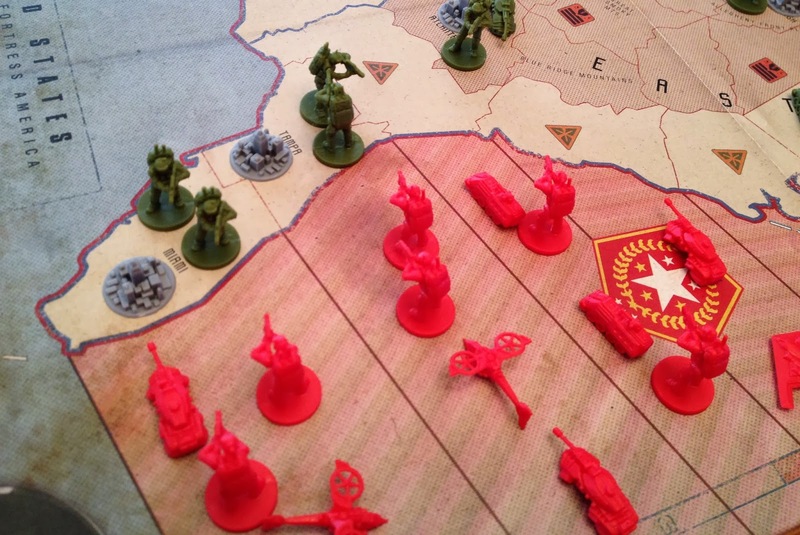 It certain does have some unique aspects to it; I’d rather play this game than the old version of Risk, but it hasn’t aged well. Taking Florida. Hey…even Commies need vacations. 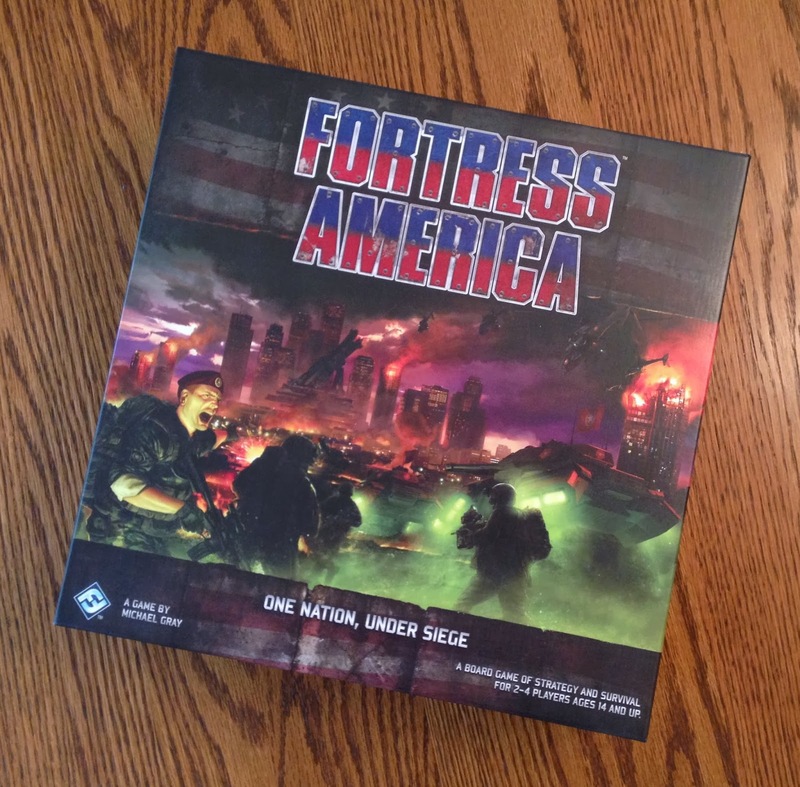 If you love these sorts of war-games, Fortress America is perhaps a worthy addition to your collection. It tells its own story and it’s an interesting story, it’s just not one that I personally would like to experience many times over again. If you grew up on Fortress America, there’s definitely something to be said for nostalgia. This edition is certainly finely crafted with great components, a very nice-looking board, and fun custom dice. Other than that, this game feels slightly outdated with its linear progression and lack of anything besides dice-rolling combat to progress through the game.